R4-D5 is a Star Wars Minifigure introduced in 1999, first appearing in 7150 TIE Fighter & Y-Wing, and then having five more appearances later. 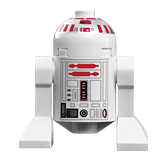 R4-D5's head piece was used in 7143 Jedi Starfighter, but LEGO's description referred to the droid as R4-P17. He was often mistaken for R5-D4.